We will develop novel tools and methods for efficient modelling, developing and testing of embedded systems (like Internet of Things or Cyber-Physical Systems). Outcome will be an easy-to-use and tailorable prototype of an integrated model-based development environment (IMDE) that will reduce the overall lifecycle cost by about 50%. It will provide real-time model sanity checks, automated test generation, advanced modelling assistants, on-target debugging, and test quality visualization. Facing complexity increases and pervasiveness of embedded systems, a productivity push in embedded systems. The available development resources in Europe cannot keep up with the increasing demand for new systems. – dynamically interconnected systems needing more verification. The planned IMDE will provide a step change in coping with these issues. 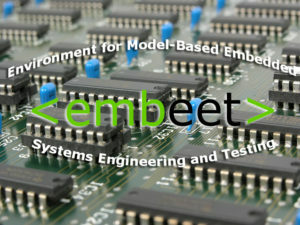 The goal of this project is to establish the technological basis for a fully integrated model-based development environment (IMDE) for embedded systems. Its main result will be a first implementation within one existing model editing environment – Sparx Systems‘ Enterprise Architect – where partners LLS and CNS have extensive experience in extending it. While the IMDE will encompass features for model-based development inspired by available state-of-the-art integrated development environments (IDEs) for classic software development (e.g. consistency analysis and “sanity checks”, non-intrusive highlighting of their results, quick fix suggestions), the project will go beyond that by incorporating model based development, testing and debugging. In order to do so, innovative solutions are needed to keep waiting times for the user short, despite computationally expensive analysis and generation is done in the background. The technological basis for such an IMDE will build on and support a tailorable, model-centric development method/process, and will be elaborated in detail during the project.